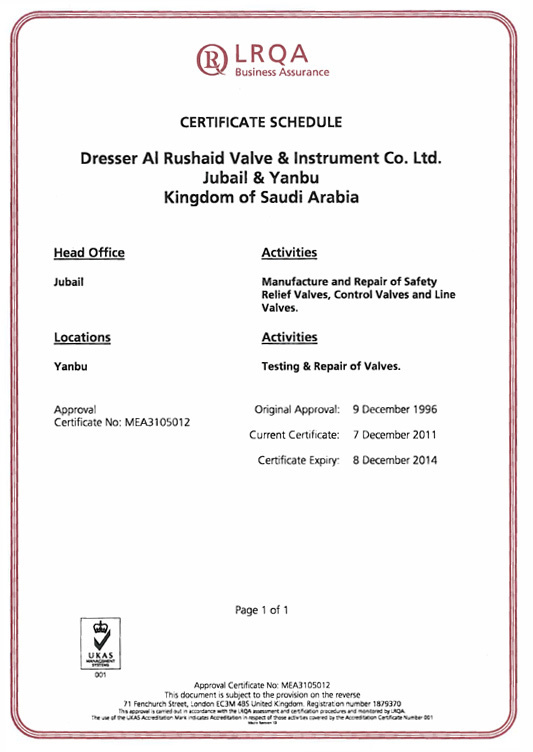 About us | On site calibration of valve positioners, diagnostics of valves are also carried out. In addition to the manufacture of new products, DARVICO also undertakes shop repair and recalibration of Safety Valves and on-site testing with the latest Electronic Valve tester contracts for servicing of control valves in our plant and also at site are undertaken. 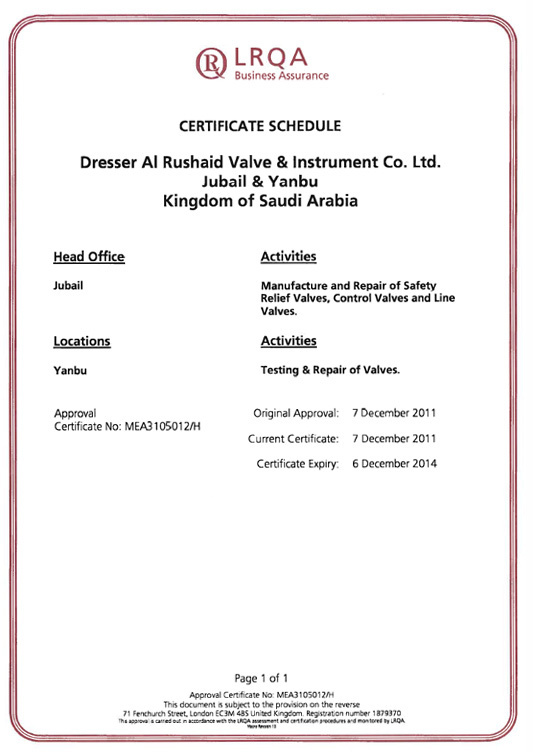 On site calibration of valve positioners, diagnostics of valves, are also carried out. DARVICO also provides custom solutions for even the most difficult applications. Quality is a foremost priority, and the entire design, manufacturing, and testing process is regularly audited by independent accreditation bodies. 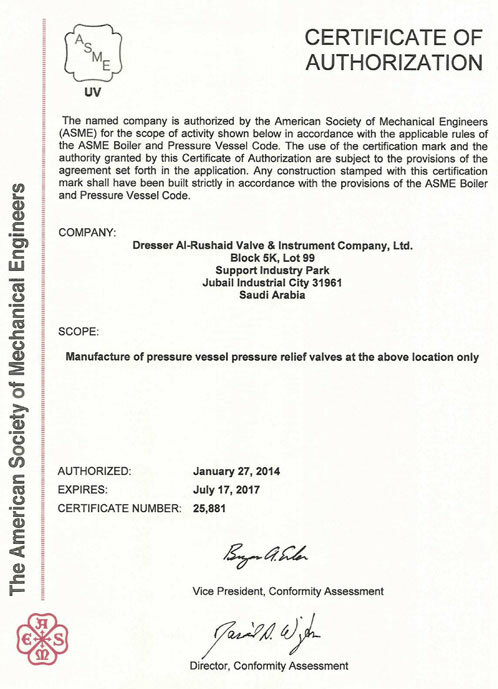 DARVICO shops have been audited and approved by the National Board of Boiler and Pressure Vessel Inspectors of the US and have the same ASME Certificate of Authorization for stamping our Safety Relief Valves with the ‘UV’ and ‘NB’ stamps, as a mark of conformance to the material and performance standards of ASME Code Sec. VIII Div. 1 & 2 (Certificate attached). 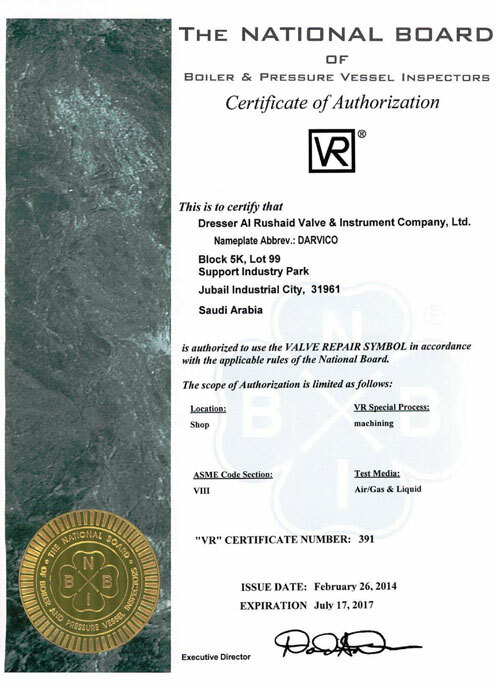 DARVICO is the only valve shop outside of North America to hold the ‘VR’ stamp for valve repair. 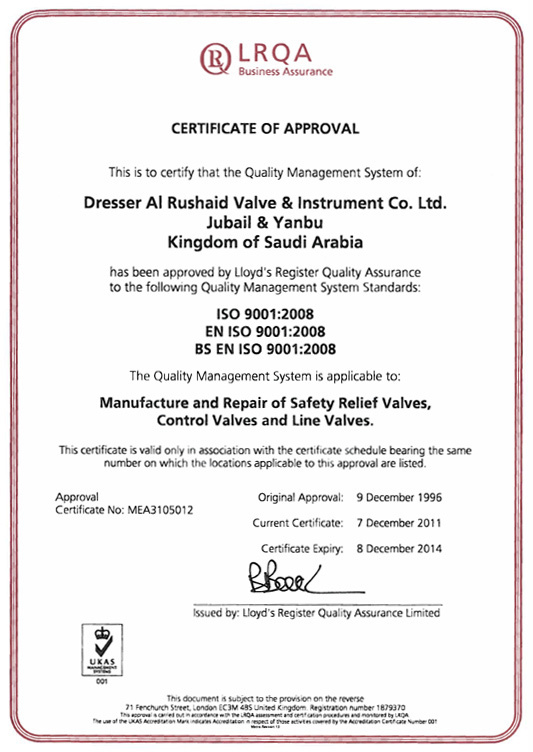 Safety Relief Valves repaired by us, shall conform with the performance standards, specified in the ASME Code Sec. VIII Div. 1 (Certificate Attached). 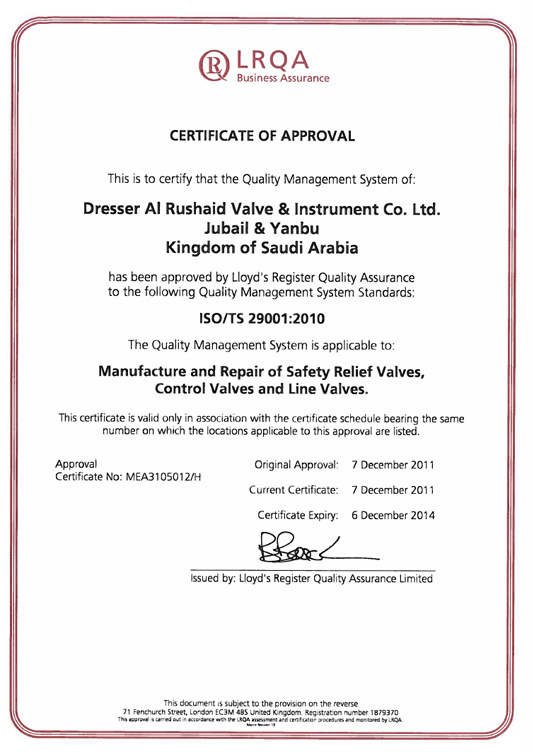 DARVICO Quality Systems have now been audited and approved by Lloyd’s Register Quality Assurance Ltd., and they have been certified to ISO-9001-2008 (Certificate Attached). 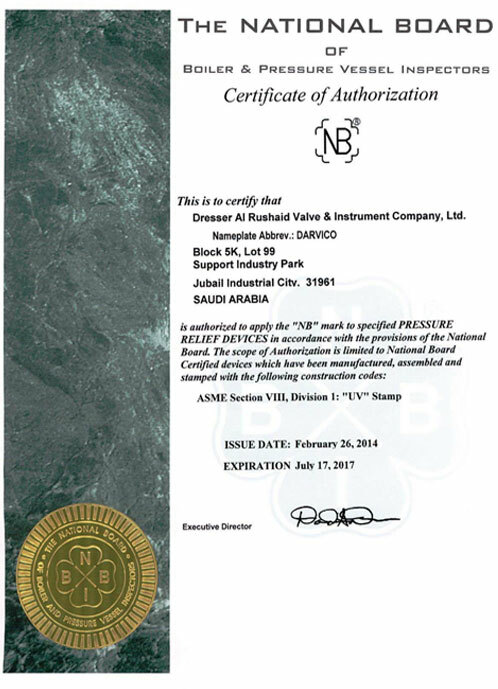 DARVICO is and approved ARAMCO supplier (Vendor ID No – 10012486 (Old ID No – DD-7610 01) for the products listed above and DARVICO has an annual contract with ARAMCO for the supply of all products we manufacture. DARVICO has a trained and experienced crew of Assemblers, Testers and Calibrators who are annually recertified by Dresser’s Training Manager.